The DogCam Bullet HD 720p video camera is that small, has no wires, and will shoot up to 2 hours of video on a charge of the built-in battery. That's about as much as I know about video. I just mounted the camera on the handlebars, went out for a couple of rides, and pressed the 'on' button to begin recording. About halfway through the movie is the new chicane I've complained to the local Council about. A white Volvo Estate squeezes past where the road is narrowed at a bus stop (I now have my proof that this feature is not a good idea). The top of the bars is a better place for the bullet cam than below the hood. 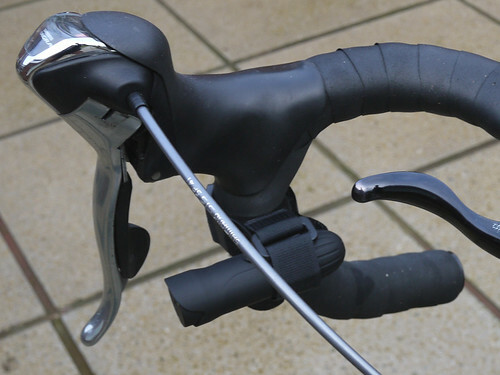 It comes with fittings to attach it to a cycling helmet but this looks a bit fiddly. On the bars you know exactly which way it's pointing. The video image size straight off the cam is 1280 x 720 pixels with a view angle of 63 degrees. Viewed on my PC the HD quality is good but the file sizes are far too big for the web. I processed the movies in Windows Live Movie Maker and saved them at a size of 426 x 240 pixels for uploading to YouTube where they are shown at 640 x 360 pixels. On this page they are sized down to 500 x 280. Inevitably the picture quality is now much lower. For best results, press 'play' then 'pause' while the pink bar gets well ahead, then 'play' again and choose full-screen mode. 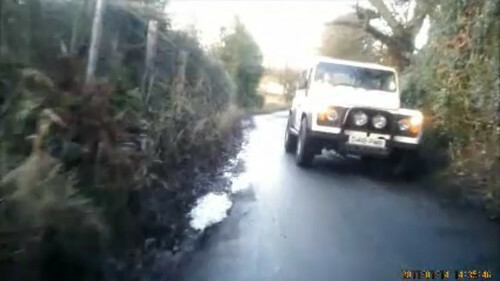 The vehicle's numberplate – and even the driver's face – can be clearly read in the first image but not in the second (click images to enlarge). The date and time at the bottom corner are also unreadable. I assume this loss of detail is because the video has been shrunk in size, then the shrunk size enlarged again. I'll write a user review of the DogCam Bullet HD in due course. Initial impression: a good cycling toy for under £100. Windows Live Movie Maker, incidentally, comes as part of Windows 7 but is only a very basic video editor. Posted by Patrick on January 15th, 2011. Patrick, you have found my birthday prezzie! Yes, I imagine an Apple Mac comes with better video editing software than a PC. Along with the camera I bought a right angled double hook and loop mount on this page. This brings the price to just over £100 for free delivery. DogCam's price for an 8-gig MicroSD card is ok at £20. Then you have a card formatted for the cam, with storage for up to 3 hours of video. 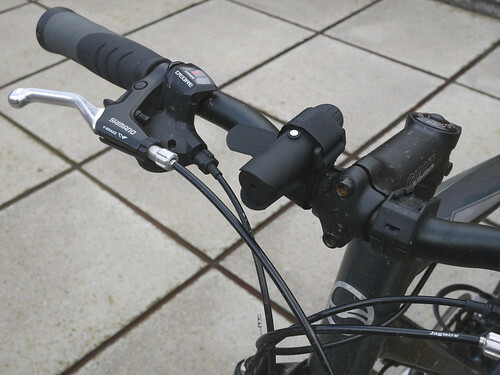 The rightangle mount makes it very easy to fit the bullet cam to handlebars and to turn it on and off with the little LED indicator light in view. If you can't see the light you can't be sure if the cam is on or not. Fitting it to a cycling helmet is a bit more involved. It's supplied with various velcro straps etc but the elastic strap combined with the plastic bracket looks the best bet from what is supplied. I should perhaps have also bought a double hook and loop mount for vented cycle helmets. With that, you might be best to turn on the camera before putting your helmet on. Trial and error I think. It was Alan's Quick Spin Post that got me started on this. I have used a camera on my helmet before Patrick, and cycled an entire mtb route over 20+ miles before noticing the camera was off! I was surprised how well your little cam video managed, especially as it was on the handlebars where there is usually a lot more road vibration than on a helmet cam. I like the idea of being able to see an 'on' light which my wee camera did not have, so you were almost guessing if it was on or not – unless you had good eyesight. It made a nice clear wee film without making the viewer 'car-sick'. To check if my GoPro camera is filming, I have to look at the LCD panel, which is on the front, so my ugly mug gets in the video. Duh. I think the other sound is the wind. I've made a few more cycling videos and they all sound like a train. With better software I can maybe filter that out – not sure. I can certainly remove the sound altogether (or add Murray Walker commentary or music). The best place on the bike is the bar tops. Next to the levers wasn't clever. I'll fix the cam to my helmet before too long. A glorious 20 minute descent down the Blue Ridge Parkway, with vistas across the Shenandoah Valley in spring. A few words paints a thousand pictures. I'm not sure I'd rely on this miniscule device to capture special moments, though I suppose they can come out of the blue. The cam's main feature is its tiny size and simplicity of operation. Velcro strap, press start and go. That's a brilliant little camera, Patrick. I'd guess that the only reason for wearing it as a helmet cam would be that in the event of an incident, it could help to prove that you had in fact checked over your shoulder, up the side road and in your crystal ball just before being knocked off (by a white volvo, perhaps? ).